The high pricing of replica England shirts is taking "advantage" of families of football fans, according to Prime Minister David Cameron. 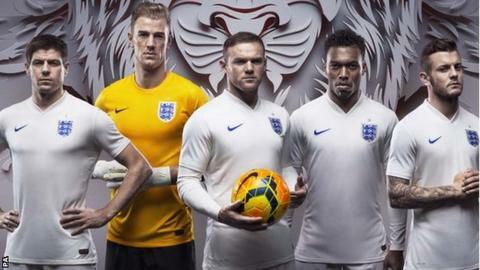 The Football Association has been criticised after new England replica shirts went on sale for up to £90. Speaking to BBC One's Breakfast, Mr Cameron said: "Parents are under enormous pressure to buy the latest kit and we shouldn't be taken advantage of. "It's very expensive," the Prime Minister said of the World Cup jerseys. Kit manufacturers Nike have said the £90 shirt represents less than 1% of the stock on sale to the public and that cheaper "stadium" England shirts were available, at £60 for adults and £42 for children. The Prime Minster's public intervention comes after his spokesman said on Wednesday that Mr Cameron would welcome a rethink on the £90 price. Mr Cameron was initially responding to comments made by sports minister Helen Grant, who was also critical of the cost. The spokesman said: "Does he agree with Helen Grant that £90 is a great deal of money for a replica shirt? Absolutely." The Prime Minster believes a rethink would be welcomed by fans, added the spokesman - although he stressed the price was a decision for the manufacturers and the FA to agree. The FA said it avoids discussions about pricing with kit manufacturers. Mrs Grant said on Twitter: "On £90 England football shirts for fans, it's not right. Loyal supporters are the bedrock of our national game - pricing needs a rethink." Shadow Sports Minister Clive Efford had earlier claimed the pricing strategy was "disappointing" while Queens Park Rangers midfielder Joey Barton called it "appalling" and "taking the mickey". The most expensive Nike "match shirts" will be identical to the ones worn at this summer's World Cup finals.